For the 17th year, The Justice Brothers-Shav Glick Award recognizes motorsports personalities who have made distinguished contributions to motorsports in California. Ed Iskenderian has been selected as the 2016 winner of the 17th Annual Justice Brothers-Shav Glick Award. For the 17th year, the Justice Brothers-Shav Glick Award recognizes motorsports personalities who have made distinguished contributions to motorsports in California. Iskenderian was selected by a judging panel, which includes national and California motorsports media, to receive the prestigious 2016 Justice Brothers-Shav Glick Award. 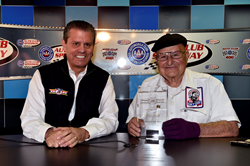 Ed Justice, Jr. President & CEO of Justice Brothers, Inc. presented the award during the pre-race ceremonies at the 2016 NASCAR Sprint Cup Series Auto Club 400 race, at Auto Club Speedway on March 20th. Ed Iskenderian – A true icon of the speed and performance industry that was established in Southern California after World War II. Born in the Central Valley of California, Ed’s family moved to the Los Angeles area pre War where Ed attended Polytechnic High School. It was during this time that Ed built his first Hot Rod and in the process became friends with the legendary Ed Winfield, considered to be the father of hot rodding. After his service in the War, Ed decided to go into the cam grinding business because the demand for cams could not be met by the existing manufacturers. By supplying quality well designed products for early racing legends and creative advertising, the “Isky” name became a hallmark. His products would go on to be used in hundreds if not thousands of record setting runs throughout all forms of motorsport. Ed was also one of the founders of the now well-known SEMA show and association. Located 50 miles east of Los Angeles in Fontana, Auto Club Speedway is California’s premier motorsports facility, hosting over 320 days of track activity each year including the NASCAR Sprint Cup Series Auto Club 400 weekend March 18-20, 2016. The two-mile D-shaped oval is one of the fastest tracks on the circuit. The Speedway is also home to numerous movies, television and commercial productions, photo shoots, new car testing, club racing and a variety of racing schools. For more information on events at Auto Club Speedway call 1-800-944-RACE (7223) or visit http://www.autoclubspeedway.com.